Today I woke up with the excitement of crossing a border into a country I had never been to before – Montenegro. We loaded the bike, which as I said on the previous post was parked in the car park of a shopping centre and rode down the ramp that led to the road to find that unlike the weekend, the boom gate was down and there was a guard in the booth. I had seen a sign detailing the prices per hour and more importantly, the price in the event of losing the ticket, and I definitely did not want to pay that so when we saw that the guard was busy with a driver who was paying his stay we seized the chance to slip out through the gap between the boom and wall and zoom down the street without looking back. We’ll be at the border before they realise, kid. a panorama of the city. Anticipating long queues again we had set off early and taken a road south of the main one which followed the coast in order to avoid traffic. We were not sure whether there was a border crossing on that road or not, or if it would be open to traffic, for that matter. There were no other cars on the road, which was really beautiful, winding its way down to the green slopes overlooking the Adriatic. After enjoying the road for a while we came to the Croatian border, with only two cars waiting in front of us, and were let through very quickly. Two corners down the road we found the Montenegrin border, where there three cars waiting, but the police there took things a lot more slowly, taking each car’s passports into the building and coming back out again a good while later. 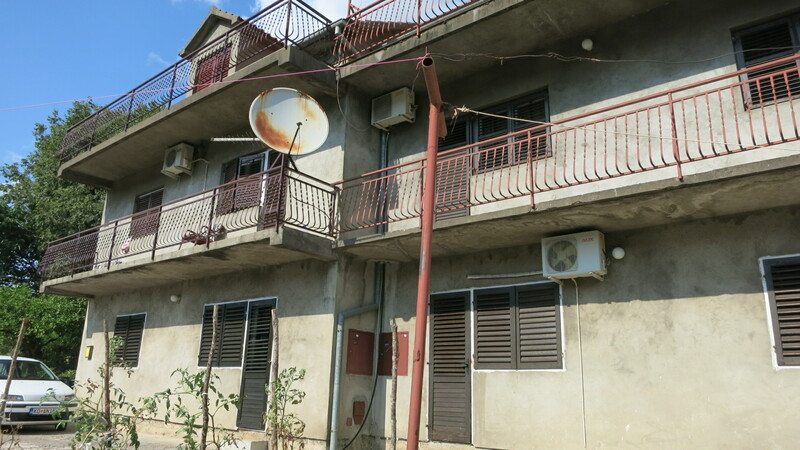 We waited patiently in the sun, with the temperature rising as the day advanced, until we were finally cleared through and arrived in the first big city on the other side, Herzeg Novi, ten minutes later, joining the traffic that was coming from Croatia on the main road. At the first petrol station we saw we found a sticker for the bike (the old Suzy doesn’t have this one!). 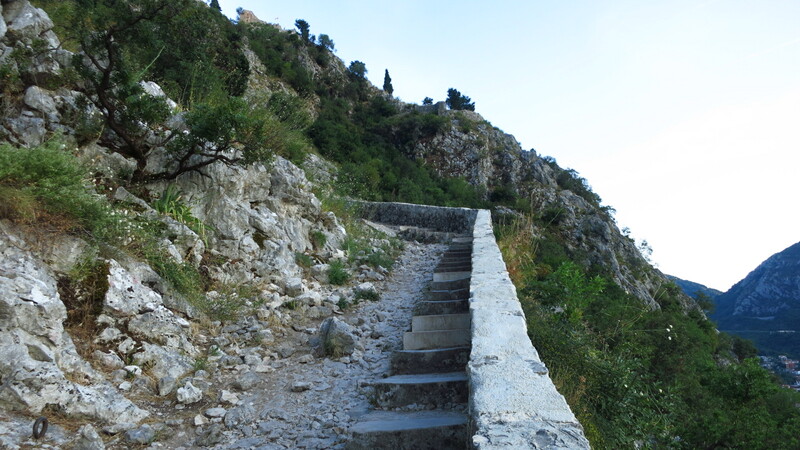 We were at the entrance of one of the most beautiful and remarkable places in the Adriatic – the Bay of Kotor, an intricate bay surrounded by mountains that reach over 1000m above sea level, and which forms what might be the only fjord in the Mediterranean area. All along its winding coast, over 100km of a road I was quite looking forward to. Unfortunately, unlike other roads that have built up great expectations in me, this one turned out to be a bit of a disappointment… the road itself is great, but it is the main thoroughfare in the area, and this time of year it sees heavy traffic. 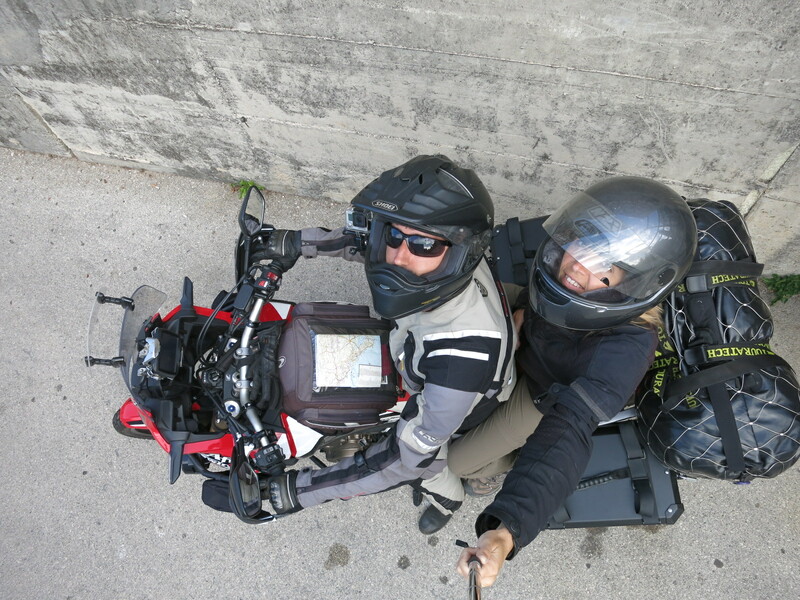 We spent most of the journey stuck behind slow traffic or not moving at all each time the road crossed a town, there was constant traffic coming the other way and it was too narrow to try and ride down the middle as I did in the Bosnian border. 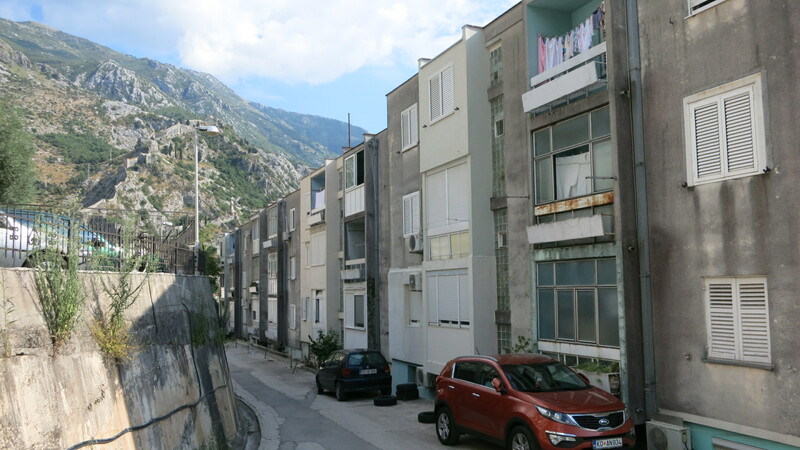 By the time we got to Kotor, where traffic was at its absolute worse, and turned off the road to find the apartment, I was glad we did not have to ride all 100km of it. There is a ferry that crosses the bay at its narrowest point, saving about half the trip, but I did not take it because I had read that the road was worth it. If you come here in the midst of the summer tourist season, I would take it. 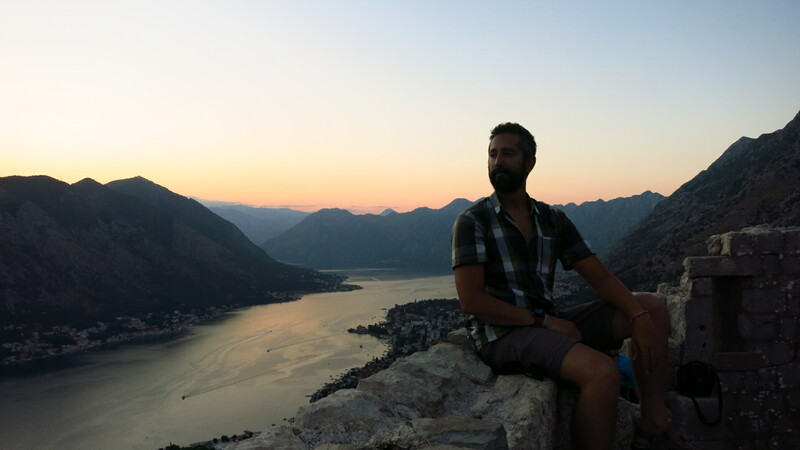 Our apartment was perched on the mountain side with a stunning view of the bay, Kotor’s old town and the fortress and its walls. To get there I had to ride some of the steepest streets I have ever seen (and those who know where I used to live know how steep the streets were there). This was Nat’s first contact with far Easter European architecture – haphazard, grey, functional, partly unfinished… and she was not impressed with the place at all. 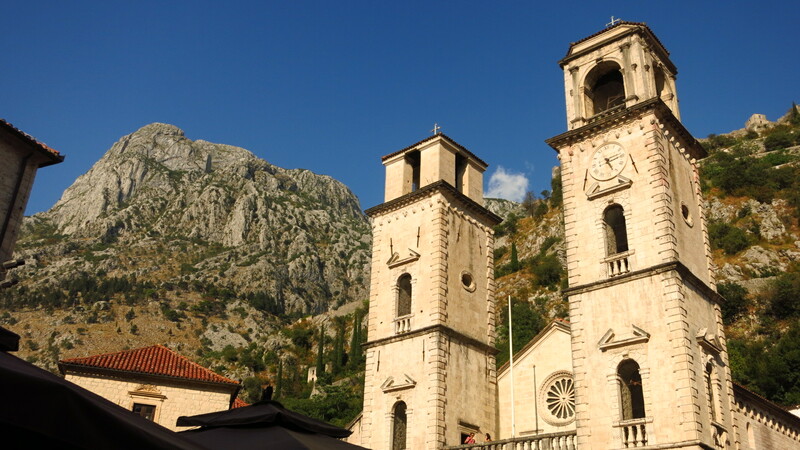 Only after seeing the apartment, which was the best we had found so far, and taking a walk in the afternoon in the beautifully preserved medieval old town did she start to like Montenegro. The heat and traffic jams on the way here had not helped either, so to compensate that we went for a swim in the town beach, which had amazingly clear water for a beach that was right next to a harbour where big cruise ships moor. With the sun and the temperature going down we felt brave enough to dare a visit to the fortress and the city walls, an impressive feat of medieval engineering that protected the city from attacks from the mountains. The wall clings to the mountain face almost vertically behind the city, culminating in a fortress with a commanding view of the city below, the bay beyond and the mountains behind. Even this late in the day, with the sun behind the mountains, the temperature was quite high, and we reached the top exhausted and drenched in sweat, but the views were definitely worth it. 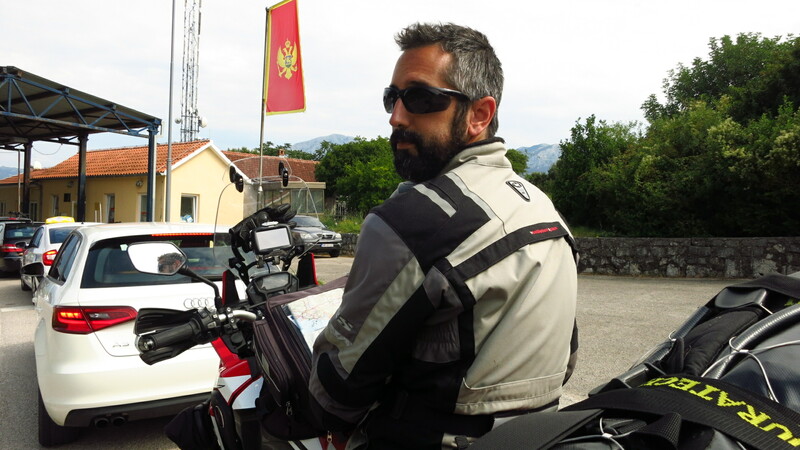 This entry was posted in Balkan Adventure 2016, Travel and tagged Border crossing, Dubrovnik, Kotor, Kotor Bay, Montenegro by Kilian. Bookmark the permalink.